The coming "moderation" that Paul Huttner talked about yesterday has all but vanished, at least until the middle of next week. Nice find Bill. When I saw this I went looking. The operational GEM and ECMWF are both on the warmer side of the guidance. Both of the ensemble means are cooler (but that should be expected this far out.) However they are both much warmer than the operational GFS. When looking at each of the GFS ensemble members there are enough of them with a zonal flow at H5 and some sort of southerly flow at the surface to believe that the warmer solution is probably correct. It looks like KSTP went with the ECMWF/GEM idea while the NWS may have used a all blend soulution. The other local outlets look like they went with what the GFS was spitting out. Right now I will go with 25° while saying it may be to conservative. I hope this thread gets some play Bill. I find it quite interesting how much different a forecast is from one outlet to another. That is why it pains me when someone says "They" predicted it would be......? Who is "they"? It all depends upon who you listen to & trust. On a side note, it will be interesting to see if KARE flip-flops from one broadcast Met to the next. 12z GFS is still cold on WED, & MOS guidance reflects this with a high of 9 degrees. 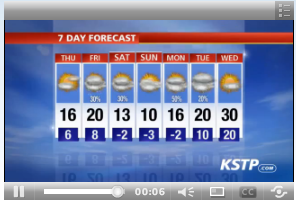 My bet is that KARE's pm forecast will contradict their AM temp forecast. To me, this is a huge issue within an organizations weather department. You have to be on the same page. If not, you are sending out mixed messages to your customers/viewers. Not good. "Well, one model predicts a much warmer temp on Wed, whereas another is considerably colder..., right now we think XXY is more correct and therefore we are leaning toward a colder/warmer forecast...etc..etc.."
Love it! Euro has so. MN approaching 40 degrees next WED & GFS has us struggling to reach 10 degrees. What will each media outlet & the NWS go with? My gut feeling says that it will be difficult to supplant this bitter Arctic air as quickly as the Euro's solution. Can't help but notice that colder GFS solution also has a hybrid looking storm system with it, with a pretty decent looking inverted trough setting up across parts of MN and WI. I'm nervous about how cold it could actually get if we get a big fresh snowpack ahead of that next potential arctic air surge that the models are showing. Really not liking this cold look. The 20's look mighty nice though in the meantime. NWS is going even colder now for next Wednesday.......they have a high of 19 now! @Duane they also mention the potential of confidence growing on a snowstorm affecting the midwest with the heavy snow band currently going from Des Moines to Madison....close enough to us that it will need to be watched....good job Duane for seeing that potential. Bring it already. With this kind of snow pack and cold air in place, the potential for any snow to be all snow and large is fun to see. 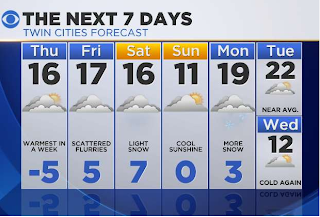 I might start dancing before it even gets into the 5-day forecast. I always like it when there is a storm "on the horizon." At least it gives everyone a chance to talk about something, other than cold! The 12/18z run of the GFS now is showing highs in the mid 20's for next Tuesday, about 24 hours faster than the warm up shown by the GEM/ECMWF. The 12/12z runs of the GEM and ECMWF both show a area of low pressure over the Dakotas setting up Tues into Wed.. If that should verify I do believe we could see temps above normal. However I don't think the 40's into southern MN as shown by the ECMWF will verify, more like 35° with temps close to 30° here in the metro. At any rate, after that the models seem to be in agreement that we could see the coldest temps yet. Horrible horrible 00z gfs just out for next friday. rain, freezing rain, with 850 mb above freezing. let's hope it's not the start of a trend.. POWERFUL STORM THAT WILL TRACK NEWD ACRS MUCH OF THE COUNTRY. They are already saying "all snow" for the MSP area. This will be fun to watch! I don't really understand why they are jumping the gun on saying it would be all snow. It seems entirely too early for that kind of bold statement, especially considering models are showing some warmth getting pulled into the system. They could be looking at the climatology of these types of systems and are expecting a shift south with it, but still it seems too early for that. If we do, in fact, get all snow with it and it's a decent size storm, then kudos to the NWS for seeing the models flaws. Something to keep in mind though. If, in fact, it is a warmer system for MN and WI and we do get a steady rain as opposed to snow, that could easily cause some major issues with trees and power lines. Given the extreme cold we've had all of those surfaces are well below freezing and any water would easily freeze on them, even if air temp is above the freezing mark. Certainly a system to watch though because lots of different types of precip could be in play here. That system will pull in our next arctic shot, so another rapid temp drop will be expected with that storm. I know that nobody can control the weather, but I'm going to be extremely unhappy if we get anything other than snow from the storm next week. What a complete waste of all of this cold air that would be. Rain could spell a last minute disaster for a white Christmas in the metro. What a tremendous psychological blow that would be to winter fans, especially after an excellent start to winter so far this December. I'm going to pray that the storm does shift south. Get some help before it's too late. Seriously. Don't put your hope in MN weather. No matter your preference, it will ALWAYS let you down. Sounds like comments typically associated with the Vikings. NWS now says the storm could be warmer. PD says "wintry mix possible for Thursday." Seems like a lot of uncertainty. I too was surprised with how quickly the NWS came out and jumped on this storm. Maybe it will still materialize and be colder, but what the heck - a week out? Take what PD says with a grain of salt......his blog just about 12 hours ago read "I dont see no major storms beween now and Christmas!". STARTING ON THU IS WHERE THE FORECAST BECOMES QUITE INTERESTING. WOULD BE ANOTHER SHOT OF FRIGID ARCTIC AIR ON THE BACKSIDE. I think what will happen is that a area of low pressure will develop over the Dakotas bringing warm air into the region by about Wednesday or maybe Thursday, and to Duane's post above the precip type could be problematic considering the cold surface's, but irregardless when that system passes to our east it will usher in much colder air. So much so that when the low pressure forms over the lee of the Rockies it will get suppressed to our south and east. A major winter storm should it develop will mostly effect IA, Southern WI , Illinois and Indianan. 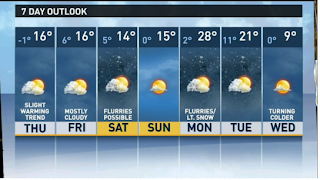 Jonathan Yuhas(KSTP)....on Thursday's system, "periods of snow with some more significant accumulations possible". Fun fact to follow thru the coming days and weeks.....currently MSP is in a 11 day stretch of high temperatures at/below freezing, the NWS forecast temperatures for MSP for the next 7 days keeps high temperatures below 32.....so according to the NWS that streak should make it to 18 days. If we should make 28 days that would put us into the top 20 all-time streaks of 32 or below high temperatures.....the record?, if you were wondering is 66 days.....so how far do you think we will go everybody? I have a sneaking suspicion that we sneak a 32 in on Wednesday. I say the streak continues and we easily make it to 20+ days, too cloudy to crack 32 this week in my opinion and then the arctic air comes back. 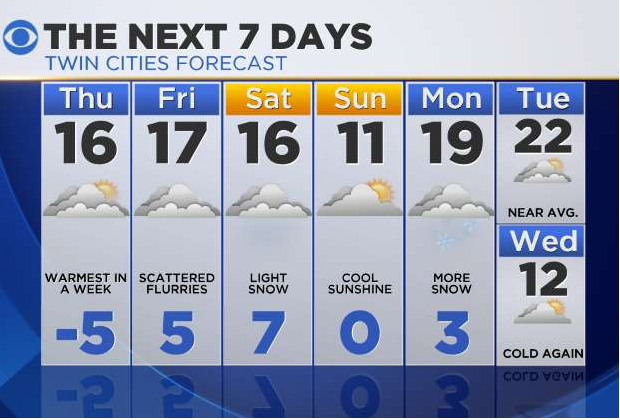 Yep, I agree @ Bill with you.....Wednesday looks to be the spoiler for above freezing temps....maybe we get a surprise cloudy day and temps hold around 30°, we'll see....I for one like to follow streaks so I hope we dont crack 32 Wednesday. I'm becoming less and less optimistic about this storm system for the end of the week. I realize it is still several days out but this looks like it will be another disappointment. It's frustrating watching these systems several days out have good potential only to have one or two things not go right. This looks like it will be another example of that. Everything has to go right for these storms to develop, and if the timing is off on one of those factors then everything goes to complete crap. Is there still time for things to shift and become more favorable? Sure, absolutely! But quite frankly, I'm not expecting it or remaining hopeful that it does. All the phasing and real strengthening of the low happens just to our east (much like a couple other systems have done this season). If there is any good news out there, it is the fact that models have backed away a bit on the next major arctic cold shot that was supposed to come in. I was hoping for a legit snowstorm this week, but I'm perfectly fine with the true arctic air keeping itself in Canada. It will still get cold after the system passes, but doesn't look nearly as bad as it did before. Its coming down hard currently in Golden Valley.....too bad its a quick burst..........but any snow is great snow for this snowlover. NWS: (on our weather for later this week), "our region will likely miss out on another winter storm". But the good Dr. Novak has MSP and points north under a "moderate" travel impact for Thursday, so theres hope yet snow lovers just depends who you listen too. Dr Novak has consistently overplayed the last couple of storms 4-5 days ahead to then come to terms with the facts. It is easy to track his tweets and see how his travel impacts was downplayed as the last 2 storms came closer. He will do the same this time around. I am surprised how this storm is getting so much attention: it was never going to be a significant issue for the MSP area: at the beginning the low was too north and west that it would have created p-type issues. Now it is clearly going to miss the area as the split flow develops. KARE just refuses to give in. Belinda is still going with only 28 on WED. They are so conservative that it is not even worth watching. Whether doesn't revolve around "normal" or the MOS. I would rather have a weather outlet try to predict the radical swings than be so cautious; It is the easy way out. KARE just refuses to give in. Belinda is still going with only 28 on WED. They are so conservative that it is not even worth watching. WEATHER doesn't revolve around "normal" or the MOS. I would rather have a weather outlet try to predict the radical swings than be so cautious; Conservative is the easy way out. It's really interesting how each TV station seems to have its own "brand" with regard to forecasting. KARE, who predicted "possibly up to an inch" today, always seems conservative. KSTP, always seems to have a "go for it" attitude. The long-range forecast for this Wednesday (the subject of this blog post) is a good example. Dave Dahl using words like dusting and nuisance for Thursday system, seems to me that this 'event' will be just like most of our December snowfalls.....is there any chance of a major storm in our neck of the woods before the New Year? DD also mentions about a possible snag in the weather about xmas eve....but he only talks about tumbling temperatures, nothing about precip.......will there be some active weather around the holiday? Hmmm, last night's NWS overnight forecast for Eagan was for a 100% chance of snow, 1-2 inches. We didn't get a flake! How is it possible to absolutely blow a forecast that badly when the "event" is a mere hour or so away from beginning? If this, is, in fact true, then it must have been a situation where the snow wasn't reaching the ground. I went back and checked the radar loop from overnight and there were some decent returns over the metro area (Eagan included). It looked like there should have been some snow falling, but the 1-2 inch total was probably a bit much. The snow blossomed nicely as it was crossing over into WI. We saw another nice little burst of snow that lasted just under an hour here overnight. Just to add my two cents, I also saw the NWS forecast last night for 100% chance of snow. However, at least here in Rosemount this morning there were no indications of any fresh snow. The cars, sidewalks, steps, roads, etc. showed no signs that snow or anything else had fallen. Surprising that nobody forecast the micro-thaw overnight. Emphasis on the word "micro." Honestly, I expect to see every single salt truck in the free world on our roads today, given that it's their one chance to clear the ruts. I'm not giving up hope, though I haven't seen any yet. There are still many roads in very bad shape. The annoyingly frequent small bursts of snow haven't helped matters. I'm getting nervous about this weekend's storm system. 12z GFS continues the trend of shifting the track NW. Plus, jet structure looks fantastic for this storm, even over the Upper Midwest with phasing & a coupled environment. Gut feeling is that this is going to be a monster over the Midwest. I'm just not sure how far NW to pull the significant snow band. Right now, WI, IL & eastern IA look most favorable, but that could easily shift further north into MN with successive model runs. Anxiously awaiting for the 12z Euro to come out. What is also scary is that the 12z GFS AND 00z Euro have the best 700mb dendrite growth zone dangerously close to MSP. Euro model is in, and it does expand the deformation zone closer to the area, but it's still SE of the metro. If anything, it brushes far SE Minnesota. Models have been fairly consistent with developing this major winter storm, and all the ingredients seem to be coming together. Trough coming through takes on a negative tilt, northern and southern jet phase, good temp contrast, and a good connection with the Gulf. All these things, plus several other things need to happen for this storm (or really any big storm) to happen. Remove one, and it becomes less impressive. I'm remaining hopeful that the models shift this thing even further northwest but the ridge in the southeast would have to build up more or the phasing would have to happen sooner to allow for the low to turn more to the northwest. Anyway, here's a look at the Euro for Sunday. Of note, the other models are further south with the Thursday snow, but that looks more like a 1 to 3 deal at the moment. Is this Weather Advisory for this afternoon really warranted? Doesn't seem like it to me, though I live in the urban core. Almost seem as though the NWS just wanted to dig into their bag of tricks. It's bad in the far western metro; not so much anymore, but visibility was significantly reduced late morning/early afternoon. I can't believe nobody in the metro saw any snow at all last night. That is shocking to me. Like I said before, I went back and looked at radar and there were some decent returns that showed up over parts of the metro area. Tough to forecast that exact of a location, but maybe going with lower percentages would have covered for the spottiness of the snow. I hope you're right. 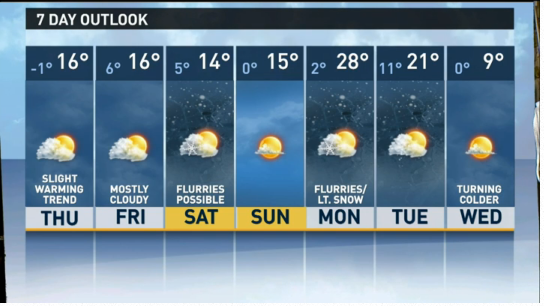 Belinda on KARE 11 just said maybe some light snow showers from the Thursday system and that's all. Dahl said earlier only a light dusting. Let's do the snow dance, everybody!! I've already cancelled all of my plans this weekend, assuming that it's going to move a couple hundred miles north and nail MSP with 20 inches of snow. Keep dreaming, very rare MSP gets 12 inches in a storm these days let alone 20 inches. Move to Vermont or Maine they get a couple of those a year, here the planets need to aline. Maybe this storm will bring the dome down and save all of us tax payers some deconstruction project costs! @Randyinchamplin your favorite Canadian GEM model brings headline worthy snows into MSP for this weekend....verifying Dr.Novak nervousness on how close this storm can get to MSP.....are you buying/agreeing with it or you sticking with most everyones favorite the Euro model which keeps us high and dry(btw...the GFS is between the two)......NWS has introduced a slight chance(20%) of snow as far northwest as Red Wing for this weekend when yesterday it was all dry for the entire CWA.....heres hoping for another model wobble northwest. With the last 5 runs of the deterministic ECMWF and the lastest ECMWF ensembles following suite I don't know how you could bet against it. Therefore, its almost a certainty that this large storm stays south / southeast of MN. Remains to be seen, but it looks like last week's met.no forecast high of 36 for today might be correct. The Norwegians did something right! Just a few days until one of my favorite days of the year: the winter solstice. Headin' back towards spring/summer very soon! 12Z EMCWF has actually moved NW to agree with the GFS! Somewhat shocking. For Thursday's system or Saturday's?